In this crowded world of conventions and pop culture events, it's nice to know that expos like the Long Beach Comic Expo still exist that highlight the medium that got us to where we are - comic books. After all, were it not for those pages of ink and color there wouldn't be multi-billion dollar earning feature films, highly rated television shows or gaggles of people dressed as their favorite characters roaming the aisles of cons around the world. Unfortunately, the rise of comic books as properties to be exploited and "branded" for general consumption has brought with it the push of corporations to heavily market their investments and where better than the hub of geek culture - a comic book convention. comics, sci-fi, horror, video games, or geek culture in general. It's become a showcase for the next great big studio feature, which for superhero movie fans has been an embarrassment of riches, but has marginalized the source materials. Thankfully, the flurry of conventions nationwide has given way to smaller ones like the Long Beach Comic Expo that still value sequential art and give it the respect it deserves. In a single hall, the LBCE looks like any other con until you take a closer look. There's no main stage or colossal booth set-ups, no major studios or even the two biggest comic book publishers in attendance. What there is, is a throwback to what drew people to these events in the first place. Amid the rows of vendors of toys, costumes, and good causes it's the local comic book shops with their booths adorned with comics and graphic novels that take up the most space. There's an 'Artist's Alley' with some of the most talented people on the planet offering their beautiful prints to an appreciative crowd. An entire row devoted to cosplayers who've been inspired by these same folks. Small comic publishers are there with writers and artists from neophytes to legends of the medium. Names like Brian Wood, Matt Hawkins, Brian Buccellato, Dustin Nguyen, Garry Brown, and many others are there and accessible to adoring fans. They'd be virtually unreachable in the herd of humanity that fill the aisles of the biggest cons. Everything about LBCE revolves around comic books. The panels celebrate the artform with special guests like Chris Claremont, Ethan Van Sciver, Terry and Rachel Dodson, Gerry Conway and many more. There's a guide to self-publishing, panels for kids, panels with showrunners of comic book-based television shows like Tara Butters (Agent Carter) and Marc Guggenheim (Arrow). To call the Expo fan-friendly is a gross understatement. Cosplayers were invited to the inaugural cosplay contest. And in perhaps the most poignant event at the Expo was the first Dwayne McDuffie Award for Diversity ceremony. The award named after the talented and accomplished writer- producer, Dwayne McDuffie who co-founded the groundbreaking Milestone Media imprint featuring a line-up of heroes that were often ignored by the major publishers. He paved the way for putting people of color at the forefront of comics both in characters and creative talent. He passed away from complications from heart surgery in 2011. This year's nominees included Hex11 by Lisa K. Weber and Kelly Sue Milano (HexComics), M.F.K. by Nilah Magruder (http://www.mfkcomic.com/), Ms. Marvel by G. Willow Wilson and Adrian Alphona (Marvel), The Shadow Hero by Gene Luen Yang and Sonny Liew (First Second Books) and Shaft by writer David F. Walker and artist Bilquis Evely (Dynamite). The award went to Nilah Magruder for her webcomic Hex11. Organizers for the award specifically chose LBCE for the launch based on its intimate fan-centered approach as opposed to the hype-filled morass of a larger con. We couldn't agree more. LBCE is special for its emphasis on the medium that captured the imagination of children for decades and continues today. 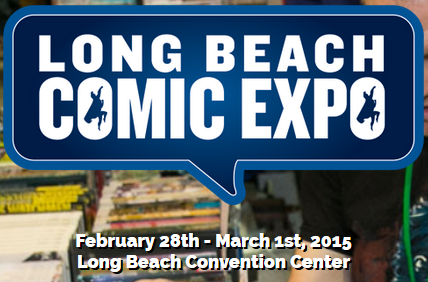 Long Beach has been the perfect venue to accommodate fans, families, talent, exhibitors, vendors and media. The 6th annual Long Beach Comic Expo was a resounding success that despite its growth has held true to the core value of the medium that shares its name - comics.